Super-what you might be asking? Superfoods? What on earth are those? Sounds like some scammy supplement you’re trying to sell me! Actually, superfoods are food that are incredibly high in a couple compounds that have been shown to dramatically help you fight disease (like cancer), boost your immune system (bye bye colds! ), and provide vitamins and minerals in much higher concentrations than normal. But first, what are these foods actually giving you? Superfoods will help you have more energy throughout the day, sleep better, and recovery from injury or illness quicker. Again, these should all be part of a lifestyle that involves a proper diet, a little bit of physical activity, and a schedule full of things that make you happy. It’s the combination of many factors that promote optimal health, and not just adding a superfood or supplements to a poor diet. In regard to these superfoods, the cool thing about them is that you can generally eat as much as you want without worrying about adverse health effects. The one exception to that rule would be red wine. 😉 Please don’t become an alcoholic and say to your friends “But it’s a superfood!! !” A glass or two a night with dinner is fine. Berries (in this example, blueberries), contain a whole host of micro-nutrients, vitamins and pigments that are currently under research for their role in reducing inflammation and the risk of cancer. Some studies in rats showed that blueberry has helped with reducing brain damage after stroke, regulates blood pressure, and helps lower cholesterol and blood lipid levels. When the season rolls around, make sure to stock your fridge with as many as you can get! Hot peppers are great sources of Vitamin C, beta carotene, folic acid, magnesium, and many other minerals. A study published in the British Journal of Medicine found that regular chili consumption helps fight the progression of heart disease. Capsaicin – the compound responsible for the incredible spice in Chilis – has been studied extensively for it’s anti-cancer properties, and in particular, prostate cancer. So how do you pack the maximum punch for the minimum investment? The hotter the pepper, the more capsaicin there is in it. What about stomach ulcers from eating hot chilis? Actually, it’s a common myth that eating extremely hot peppers will burn a hole in your stomach. The opposite is in fact true – the intense heat stimulates the release of mucus and alkaline enzymes in the stomach to protect it. Win! Don’t forget to eat your spicy food, folks. Most of the research done on red wine is in regard to a compound called Resveratrol which falls into that polyphenol/antioxidant category. Red wine contains more resveratrol than white, and even some other berries (like blueberries that I mentioned) contained the compound too. Salmon is a fantastic (although sometimes expensive) food and protein source. Salmon is high in protein, omega 3 fatty acids, vitamin D, and many other vitamins. Eating more fatty fish is a good addition to your diet because omega 3 fatty acids are notoriously absent from our modern diet. Also, many modern people are deficient in Vitamin D because we spend most of our time indoors. Salmon is a fantastic and delicious way to get these two crucial nutrients. Higher omega 3 intake is linked to lower arthritis incidence, blood pressure, and inflammation. Wild caught salmon is better than farmed salmon. Farmed salmon contains high levels of a chemical called PCB which is 8-10x higher in farmed salmon than wild salmon. Most of the salmon that comes from the Atlantic waters is farmed – while most of the salmon that comes from the pacific waters is still wild (80%+), so go with Pacific salmon if you can. Kale, swiss chard and other dark leafy vegetables are very high in beta carotene, vitamin C, calcium and other minerals. Kale (and Broccoli) also contains a compound known as sulphorafane, which has potent anti-cancer properties. Guess your mother was right – better eat your broccoli! What’s interesting is that boiling results in a significant loss of many of the vitamins (including that anti-cancer chemical). So if you plan to cook your veggies, sautee them or steam them. Green tea really became famous in the west during the whole green tea weight loss movement. In one particular study, just drinking green tea boosted the metabolic rate of people by 4% and helped stimulate fat oxidation. Although that’s one “use” of green tea, it actually is packed with certain vitamins and minerals that are great for you, too. For example, in a couple studies green tea has been shown to lower the risk of heart disease and certain types of cancer. This is because green tea is unusually high in flavonoids – and compared to other foods or drinks, including wine, fruits & vegetables, it is comparatively much higher in protective compounds. Pomegranates were originally one of the ancient medicines of the world, much like green tea. Recently, with the explosion of the “POM” juice line in the USA it has become pretty popular, and has a whole host of health benefits to back it up. Extra bonus? Pomegranates are delicious and are a fantastic, refreshing summer and fall snack. One of the secrets of the Japanese that live particularly long is that they frequently consume sweet potato as one of their main carbohydrate sources. So why sweet potato? Why not regular potatoes? When you stack sweet potatoes against other vegetables and fruits, it blows them out of the water, particularly with two minerals: beta carotene and vitamin A. In fact, a regular potato has about thirteen units of vitamin A, while a sweet potato has 14,000. A regular potato has eight units of beta carotene, while a sweet potato has 8,000. What’s interesting is that in 1992 a study was done to compare the nutritional value of sweet potatoes compared to other vegetables. Measuring for a number of different factors, guess who won? Sweet potatoes! By far. Not only are nuts a fantastic snack (they are high in protein and good fats, like we talked about in the six pack series here and here) they are loaded with nutrients. 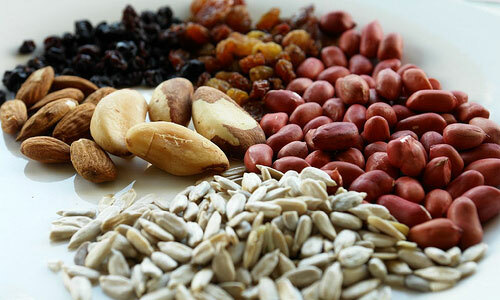 Several studies have shown that people who eat nuts regularly are much less likely to suffer from heart disease. Nuts are also low GI — so for people who are trying to lose weight they are a “safe” snack. Not only are they loaded with antioxidants, but they are high in protein, E & B vitamins, and half a dozen other minerals. The best part? They’re an easy food to pack with you and bring around so you don’t go eating a bad food due to lack of planning. One other thing: make sure to eat them in their raw, unroasted, unprocessed form. Like any food, processing or cooking generally reduces the amount of nutrients. I did an experiment several months ago, called “Why Your Orange Juice is Slowly Killing You” where I “busted” the vitamin C myth. Most people think that orange juice is the best (or only) source of vitamin C, which is simply a myth, and in reality excess fruit juice consumption is probably leading you to gain weight. In my experiment, red bell peppers actually came out highest (compared to any other vegetable I could find) in terms of vitamin C.
One cup of bell peppers had about 2-3x the vitamin C of a glass of orange juice or an orange! Sometimes veggies are a much better source of nutrients than fruits just because you’re getting vitamins without the added sugar. In peppers, the main antioxidant here is lycopene (the same nutrient in tomatoes). And interestingly enough, red peppers have nine times (9x) the lycopene that green peppers do. So if you decide to cook peppers, eat the red ones! Q: Can I just take supplements of these nutrients? Many people think that supplementation has the same effects on the body that eating food does. Well, more isn’t better. Studies have even found that excessive antioxidant supplementation has had adverse health effects. And remember that antioxidant in red wine, resveratrol? In the United States this has been incredibly hyped over the past decade, but when the actual supplement of resveratrol was taken, it has been shown to have a very low bioavailability (how much of that actually gets into your body and blood stream). So, just eat your super foods :). Supplementation or eating superfoods is not an excuse to continue eating a bad diet. If you spend 90% of your time eating junk, and then supplement with a few super foods, your body and health is going to be like what you eat 90% of the time — junk!